The best thing about going into hiding to write is that when I need to be utterly antisocial, I can be. Last night I was on a roll, doing the MirrorMask "graphic novella" (which is what they're calling the picture book version). I'd sort of planned to do a 2,000 word, WOLVES IN THE WALLS like book. Instead, I've written a 12,000 word version of the story for it, entirely from our heroine Helena's point of view, which is sometimes the way of things -- one starts out on something that was meant to be an easy sort of instant novelisation and it turns into something quite different, bigger and odder and probably much cooler. It's more like a companion to the film now: you'll learn stuff that isn't in the film from it, and it untangles a few things that otherwise you might have to see the film five or six times to understand (although because it's all from Helena's point of view, it completely misses out any scenes she isn't in). And yes, it was a lot more work than I'd expected, but I'm prouder of it than I would have been of the book I had in mind when we agreed to do it. ...anyway, I was on a roll last night. So I just kept working. And somewhere around seven this morning I realised I'd actually finished it, so I sent it to Dave McKean and went to bed. Up around eleven this morning, with a message from Dave waiting letting me know that I'd given one section short shrift, and I looked it over, and he was right, I had, and it needed to be longer, so I simply made a cup of tea and turned it into a full chapter, and did a final tidy. It went off to Dave, to HarperChildrens, and to Bloomsbury, about half an hour ago. And now I'm going to do all those things I've normally already done by five in the afternoon, like shower and make breakfast. And then it's back to the Anansi Boys second draft. Back in 1988 in the UK, Margaret Thatcher's government passed a clause in a local government act that was intended to forbid schools from talking about homosexuality as a family relationship or depicting positive images of homosexuality. It was a clause aimed, as one minister explained, at eliminating "the entire concept" of homosexuality, something that many of us found rather chilling. it was called Clause 28 and was introduced by Dame Jill Knight, who, coincidentally, had recently tried to get banned a comic of retold bible stories I'd contributed to. Alan Moore felt it rather personally, and he and his wife and their girlfriend put together a comic called AARGH! (artists against rampant government homophobia, if I remember the acronym correctly). The comic raised enough to buy a photocopier for the moore clan's local gay and lesbian centre, who, if memory serves, then decided that the entire Moore clan wasn't actually gay or lesbian enough. Clause 28 was repealed in 2003, never having been used to prosecute anyone -- although it certainly cowed and confused a number of local councils. There are those who believe that it was us doing AARGH! all those years ago that eventually caused the downfall of the clause, but they are probably the same sort of people who believe that wearing silver foil inside your baseball cap will keep you safe from meteorites. Aargh! is now part of history and so is the clause, but Alan's piece for it, the Mirror Of Love, is available in a gorgeous book form -- http://www.topshelfcomix.com/catalog.php?type=13. Some of the pieces people did for it are up on the Internet (Dave Sim's is up at http://www.cerebusfangirl.com/stories/stories.html -- it's the first four pages.) Bryan Talbot and I just gave permission for the piece we did all those years ago to be put up online. It was called "From Homogenous to Honey" which is roughly where you go in a small dictionary if you remove the word Homosexual. http://gaycomicslist.free.fr/pages/blogarch.php?month=2005-03#154 gives you the link to the comic. Yesterday my mother called to get tickets to your University of Chicago appearance (I was trying to get you a new fan!) and apparently they are sold out. They told her to call the day before and see if there are any seats available. Several of you have asked whether I'll be signing books that night, after the talk, and the answer, from what I've been able to establish so far, is yes. Actually right now it doesn't beckon; instead it holds up a megaphone in front of its mouth and is shouting "OY!" through it, and then making rude gestures as soon as it's got my attention. I should be busy writing two books right now, but Charles Brownstein of the CBLDF has asked me to let the world know that people who bid on the CBLDF auction are now getting "Second chance bid" e-mails from someone named guttermanhannah@aol.com. Needless to say, these are completely fraudulent, so I have cranked up the generator and am online for five minutes. CONVICTED on criminal charges in California for writing violent poems. The appeals court overturned the conviction. more like that and they are lost. to anything else without that basic guarantee. I've written to him with a suggestion for a way to take the "name a cruise ship" idea bigger and to get lots of authors playing with it at the same time. Thanks to everyone who spotted typos in the Anansi draft and wrote to tell me about them. Consider it mentioned with enthusiasm. There's a webpage at www.Neilgaiman.com that we really need to overhaul with links to all sorts of booksellers but which people may also find useful in its current form -- http://neilgaiman.com/asp/buy.asp?bookid=23 is the version of it for Anansi Boys. and Tom Spurgeon's 1000 Things To Like About Comics (in alphabetical order); http://www.comicsreporter.com/index.php/briefings/commentary/1244/. Right. Tea break's over. Back on my head. Hello world. I'm actually in hiding, in an attempt to get two books finished by April the 1st. Wish me luck. You can pre-order it from Amazon.com -- http://www.amazon.com/exec/obidos/tg/detail/-/006051518X (or from lots of other places, but that's the only link I can find) and I was pleasantly surprised to see that the MP3 CD is coming out at publication date (no, I won't be reading it. But I don't think anyone will complain when they find out who's doing it instead). Michael Burstein wrote to say I thought you might be interested in a little experiment I did yesterday. On a whim, I took the first section of Anansi Boys that's been posted on your webpage and ran it through the Word grammar check. I wasn't trying to check your grammar, though. Rather, I wanted to see how the selection scored on the Flesch-Kincaid Readability scale. I don't know if you consider these results significant or not, but it's certainly fascinating. It is fascinating, yes. I'm not sure how significant it is -- the kind of book that Anansi Boys is has to be written in that kind of clear prose, or it wouldn't work. any chance i can find a Neverwhere dvd in switzerland? ?Fran* honest-liar.blogdrive.comps. Probably not, but the US Neverwhere DVD is, like the A Short Film About John Bolton DVD, Region Zero (yes, it says Region 1 on the info. It's wrong) which means that if you order them from the US, you should be able to play them wherever you are in the world. Deepdiscountdvd has Neverwhere for sale fairly cheaply. For some reason, most people have decided that now is a good time to ask questions that need long, well-considered answers. All I can suggest is that, if this applies to you, you ask your question again when I'm a bit less crazed. Also, for your reading pleasure, as I learned at The Mumpsimus -- http://mumpsimus.blogspot.com/2005/03/greatest-cat-story-of-all-time.html -- Fritz Leiber's short story "Space-Time for Springers" is now up online. It's the best SF cat story there is, and if it catches you right it can break your heart. I'll be talking this summer at Children's Literature New England's annual Summer Institute: http://www.clne.org/works.htm for details. ATHENS (Reuters) - Greek prison guards will go on strike next week demanding a change of their American-made weapons that date back to the U.S. wars in central America almost a century ago. While antique shops would be eager to get their hands on them, prison guards just want to get rid of their obsolete 1911 U.S. Cavalry revolvers. The guns do not scare inmates any more as safety experts have advised guards not to fire them. It's something about that last sentence, really. It's sort of like music. He mentions the Miracleman suit and his future plans for the character. It doesn't really jibe with my understanding of the outcome, but I thought you (or your lawyers) might be interested. 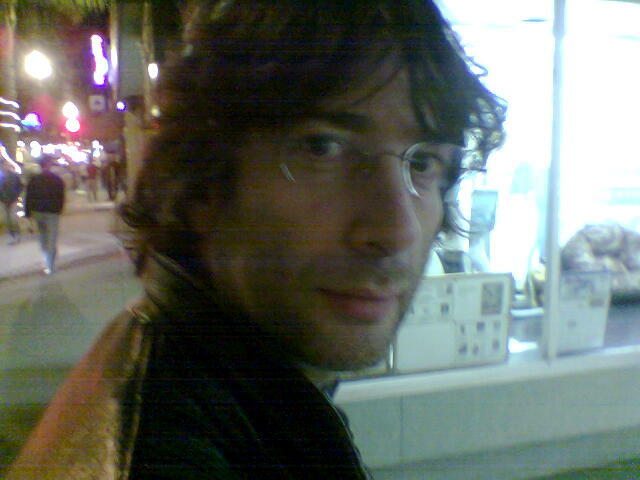 TODD: With the lawsuit, Gaiman walked away from Miracleman. I have the trademark for Miracleman. No one wants to say it out loud, but that's what happened with the lawsuit. Everyone was like "Hah hah, he killed Todd," but unfortunately -- or fortunately, depending on where you are standing -- he had to pick some copyrights to some Spawn characters or pick Miracleman. He didn't pick Miracleman. TODD: Yeah, he took some of the Spawn stuff. For whatever reason he walked away from Miracleman, so now Miracleman will be in the Image 10th Anniversary book. Beyond that, he's also distancing himself from the reality-based community in his description of the result of the legal case. (I'm not sure what to say about that, other than it's all been pretty extensively recorded.) If Todd actually owned a share of Miracleman (something that became more and more unlikely as we finally saw the actual documentation he had on it, which consisted only of: a contract that said that Eclipse's rights to the character automatically reverted if someone other than Dean Mullaney owned Eclipse, and an expired Trademark notice for a Trademark shared with me, Mark Buckingham and Eclipse) then, yes, he kept that share at the end of the trial. Meanwhile, Mark Buckingham and my share of Miracleman isn't in any doubt at all. I didn't walk away from what Todd had; Todd simply couldn't demonstrate that he owned anything that I was walking away from. Currently, I'm also one of the largest creditors of Todd's comic company. I used to get hate mail from Image Fans accusing me of delaying the Image 10th anniversary book (which was due out in 2002) because, following the trial, I now co-owned the Cogliostro character, and Todd was at one point, apparently, telling people that I was stopping the comic coming out, which came as rather a surprise to me, because it was the first I'd heard of it (and was also nonsense). Cynically, I can't help wondering if Todd claiming he's now putting Miracleman into the just-a-little-bit-late comic is just a way to put off actually publishing the comic in question for another few more years. Isn't it lovely? Anyway, it's a start. this is mostly a request to pass on some thanks. Last week, for my birthday a friend of mine was kind enough to buy me one of the Author's Preferred editions of American Gods (whether it is so she can snaffle the reader's copy has yet to be determined, but still :) ). Anyway, it is as beautiful as everyone has said it was to be (and I now have the only copy in Ireland allegedly), I'm exceptionally happy to have it and if you could say thanks to Ruthy on my behalf I should be eternally grateful. The name-the-cruise-ship CBLDF auction is over: it raised $3,533 for the CBLDF. I don't know who got it, or what the cruise ship is going to be named yet. On Wednesday I go off for ten days to finish ANANSI BOYS: it's less worrying than it ought to be, mostly because I have a pretty good idea of the scenes that need to be written. So far the feedback on ANANSI BOYS has been really positive, which has come as a relief. There seems to be pretty universal agreement on the things that don't really work too, most of which I think I already knew on some level but had sort of hoped to get away with (one place I didn't was a scene I wrote -- or thought I did -- from two different points of view in two different places, that I was quite proud of, and that left 100% of the beta readers convinced that I'd accidentally written the same scene twice, so that'll need to be fixed). Right now I'm looking forward to getting back to Fat Charlie and Spider and Daisy and Rosie and Rosie's terrifying mother and the Bird Woman and Grahame Coats and everyone. The mysterious Marvel Project Two? Hints? Sure. It's based on something that was originally drawn by Jack Kirby. And I think that's probably it for hints for now. It really looks like he 'gets it' and I really hope that exposure like this will get more attention paid to just how insanely stupid such occurances are. It's an excellent storyline. If any of you wonder about the CBLDF -- what it does, and what the human cost of the kind of idiocy we're all fighting is -- than you should read this comic strip and the subsequent ones. (I had to twiddle my firewall stuff to allow me to read it on that site.) It's an excellent portrait of what it's like for small retailers who suddenly find themselves faced with the loss of their livelihood for selling things to adults that other people don't want to read, and don't want other people to read. This Was Not Dictated By A Neptunian Brain Slug. I'm reading advance copies. I think it starts coming out in June. Reserve your copies now. There's a Mike Carey and Lucifer fansite at http://lucifermorningstar.com/ (where you can read the solicitation and look at the cover art) and Glenn Fabry has a website of his own at http://www.glennfabry.co.uk/news.htm. The art's amazing, and Mike manages to adapt the novel for comics in a way that, while respecting the story, makes no attempt at all either to sound like me or pretend to be me, which I think was probably a very wise way to do it. The eBay auction is nearly over -- it's in the final fifteen hours, so if perhaps an elderly aunt has just died and left you many thousands of shiny silver sovereigns, why don't you nip over to eBay and name a Cruise Ship in her memory? http://cgi.ebay.com/ws/eBayISAPI.dll?ViewItem&item=4535020492 -- currently bidding's at $3,205. So Zemeckis must be a MORON for not knowing that Roger Avery has a blog!! You aren't the only one!!!! COME CLEAN!! It's just a red traffic light reflected on the back of the black leather jacket. I mean, there are no Neptunian Brain Parasites. And if there were, what would one want with me? What you see in the photo is definitely not a parasitic alien brain-slug. No. Why would you possibly think that? Here, come into this small room with me while I press my hand against the back of your neck... See? Now we are united as one in the slug overmind. Is it not wonderful? Well, I don't have any use for it, but probably someone reading this might want it. Good lord. And I thought I made it up. Hey Neil,Well, I don't even knwo how to put this... um, I saw the UK cover of Anansi Boys, and it rocked the world out of the American one, I think. Anyway, I had been avoiding Anansi Boys related tidbits for a long time, wanting to read the book without any pre concieved notions and all, but I couldn't resist reading the blurb on the UK jacket.So my question is this: Is the Anansi in this book the same as the one in American Gods? Put another way, at the end of American Gods, Odin tells Shadow about Wednesday, "He was me, yes. But I am not him." I understand what this means, hence my question, is this book a kind of successor to American Gods? Is this Anansi the same as in that book? I also read your answer to the question about movie adaptations of popular books. I wanted to know what you thought of The Lord of The Rings trilogy by Mr. Jackson.Cheers, and excuse the typos please.PS Neverwhere remains, to date, my fave. Good question. As far as I can tell, the Mr Nancy/Anansi in Anansi Boys is probably the same one we met in American Gods, yes. But Anansi Boys is such a different sort of book to American Gods, being, at its heart, even when things get dark, a comedy, which American Gods isn't, that I'm not sure that takes you very far. Anansi Boys isn't the offspring of American Gods. It's more like an embarrassing, but very sweet, distant relative. Possibly a second cousin. I'm pretty sure that I've talked about Lord of the Rings elsewhere on this blog, so I'll leave it as an exercise for you to find it. From my telephone: Robert Zemeckis explaining to me that, as the only one of the three of us with a blog, it would be my responsibility to keep the world up to date on BEOWULF; Roger Avary on the street this evening demonstrating his ability to hypnotise cell phones and force them to do his will; and me (also from my Nokia 6230, photo by Roger). Together, they are the BEOWULF team. (I am, oddly enough, the odd man out, not having any Academy Awards.) Would you buy a motion capture movie from these men? And then I sent the three photos to a program called HELLO, which publishes them onto blogger. Unfortunately, and oddly, and irritatingly, the only one I could get to publish was the one of me, which rather ruins the effect of posting the caption about the three of us. But this is Roger's picture of me. Thanks to all who wrote in and told me. I only got my copy a few days ago (it arrived a couple of weeks back, but I was in New York) and I've put it on my iPod and am getting to know it. Wasn't planning to say anything until I was past first impressions and closer to humming along. Had a chat with Tori about gardening today, though. Mostly about the names of tomatoes that I'll be growing in my garden. I'm happily avoiding the trailers for Hitchhikers, and am looking forward to seeing it. All adaptations of books are adaptations, and they aren't ever going to be quite the thing you had in your head. I'm really enjoying reading the Mike Carey and Glenn Fabry Neverwhere comics adaptation right now -- it's not the thing I had in my head when I wrote it, but it's a really cool adaptation. Your Shadow may be different from the Shadow in American Gods but given the seven or eight hundred thousand readers of American Gods around the world, I'm sure there are seven or eight hundred thousand Shadows in their heads, and I'm not certain that mine is more valid than any of yours. Peter Jackson's Lord of the Rings wasn't the one in my head, nor should it be. I'd love it if in another thirty years some other filmmaker sat down with Lord of the Rings and made a completely different trilogy. In the end, it's you and the book, and your imagination contributes to the book and makes it live, and makes it unique. Beowulf's offices are huge and empty: just Bob Zemeckis, an assistant named Chris, and a lot of empty rooms. On May the 1st Roger and I will deliver the This Movie draft of Beowulf, and soon after all the empty offices will fill with people, all of them industriously doing movie things. Right now it's just Bob and Roger and me, in a little conference room in an empty office, making stuff up, out of our heads. In 2007 it'll be a Great Big movie. Yes, since you were wondering, if I stop and think about it, it is a bit weird. Cool, but weird. So I've been home from New York for four days. In an hour or less I go off to work with Bob Zemeckis and Roger Avary on Beowulf for the next four days. Then home for about four or five days. Then into deep hermit-like hiding for the rest of March, in order to make the April 1st deadline on the second draft of Anansi Boys. [It's a great day for a deadline. It's really appropriate for the book, for a start, and whether I make it or not I can still call my editor and tell her I'm done. ("Really?" "Nope. April fool.")] And somewhere in there I'm also going to write a short piece on the Arthur C. Clarke Awards and a longer piece on M. John Harrison's Viriconium stories, and the thing for Voltaire, finish going over the restored text of Neverwhere (which Hill House will publish, but which will also become the usual text after that) and probably a couple of other things I've forgotten. Sigh. There may be fewer blog entries over the next couple of weeks. Interesting. Well, if the kids are doing it as a vocabulary-building exercise, and someone tells them later that "by the way, using said is just fine" I don't have a problem with it. Learning what all those words mean and the shades of difference between them is good and useful. On the other hand if they're actually being taught that "said is dead" and that randomly inserting a word from that list is better, then they'll find out the hard way that it's not. Unless they learn it, and then, not being writers themselves, they go on to wind up in positions where they can edit or teach writers, when they will unfortunately need to be hunted down and culled, for the good of the species. It's odd -- I do run into people (particularly Americans, for some reason) who believe that Good Writing is impenetrable, and uses Lots of Long Words. I was taught, growing up, reading people like Fowler and Graves, that the secret of good writing was clarity and, where possible, simplicity, and that the aim was, above all, communication. By all means use any word you want, as long as it's exactly the right word for what you need to say. Dear Neil,Question on Stardust that I haven't seen on your FAQ. When Tristran encounters the nymph turned into a tree she promises him she will tell him three true things; two of them right away and the other when he needs it the most. She gives him a leaf, which he is supposed to listen to when he most needs it... but he never uses it. Is that a loose end or was it intended? Good writing! Well, I've never used "or fewer" with years in that phrase (and a quick google of "years or less" gives about half a million instances, as opposed to a couple of thousand of "years or fewer"). Possibly because time in that sense is, thanks to the "or", more amorpheous, like water, and the less would stand in for "in five years or (in) less (than five years)". I'd use fewer with years if I was talking about specific amounts of time. "He learned to fly in twelve years, two years fewer than it took him to learn to conjure ifrits." Right. Off to the airport. In Washington DC there's a TV show about SF and Fantasy called Fast Forward, and one of its interviewers -- often Tom Schaad -- interviews me each time I go to Washington, more or less. The last time I was in Washington was for the National Book Festival in early October, so I still have the sinister Hallowe'en beard in the interview. And I look (and sound -- the "err" quotient is a dead giveaway) rather tired and as if I've just that day driven a few hundred miles to be there, found a parking space and walked in to the interview (which is, oddly enough, the case) but I look as if I'm enjoying it nonetheless. I talk about this blog, and about M. John Harrison's Light, and 1602, and "A Short Film About John Bolton", and MirrorMask, and why I write children's books and lots of other things. Watch it at http://www.fast-forward.tv/. http://www.sequentialtart.com/tarttastes_0305.shtml is a link to a page where some of the Sequential Tarts say nice things about stuff I've written. I'm not sure whether to be embarrassed about linking to it or not. (Probably not.) Hurrah for the tarts. I am a high school student senior doing a term paper on the status of comic books as legitimate literature, and I would be ever so greatful if you would express to me your thoughts on graphic literature's impact on western culture and conventional literary thought. How do you, as a comic book writer, feel comic books are regarded by the conventional literary community? How do you feel comic books should be regarded? Any information you can give me will be invaluable to my research. Ally, go and use Google. I've given lots and lots of interviews over the years, many of which you can find on the web, about just those subjects. Also check The Dreaming website at www.holycow.com/dreaming, where many of those interviews have been extracted and archived. Good luck with your term paper. I am Officer Mark Kearney of the Waynesboro Police Department in Waynesboro, Virginia. I am writing to invite you to the 2nd Annual Book 'Em literacy event. Book 'Em takes place on October 22 and 23, 2005 right here in Waynesboro. Book 'Em is a unique book event in that we are probably the only Police Department in the entire world hosting a book fair where the goal is to highlight the connection between illiteracy/poor reading skills and crime rates. Our website is www.bookemfoundation.org. I encourage you to take a look at the site to get an idea what we are doing. We'd love to have you attend, if your schedule permits. Hullo Mark, it's unlikely that I'd be able to come -- I'll either still be on the Anansi Boys book tour, or I'll be exhausted at home recovering from the Anansi Boys book tour for a few days before heading out to New Orleans for the book festival to accept the LOUISIANA YOUNG READERS' CHOICE AWARD for Coraline. (I'd link to the entry on Coraline winning the state award at http://www.holycow.com/dreaming/ but I can't figure out how to link to individual posts there.) But I wanted to post this publically because I thought that Book 'Em looked like a Really Good Thing (and I will happily send along some signed books for the auction). At the Publishers' Lunch I attended last week, Joel Klein mentioned that the people who build private prisons in the US use third grade (that's about age eight for the non-Americans) illiteracy levels as their key to how many people are going to be in prison in ten, fifteen years, and how many prison cells they're going to need to build. Which is one of the reasons I go and click each day at http://www.theliteracysite.com. 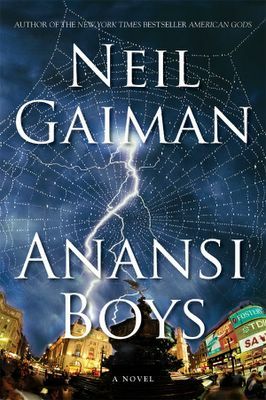 The ANANSI BOYS eBay auction is now live. This is your chance to have a Cruise Ship named after you, or after someone you love. It's not an especially interesting cruise ship, and it doesn't transform into a giant killer robot or get shipwrecked or anything. It's a bog-standard Caribbean Cruise Ship. But if you've always wanted to have a ship in a book named after you, or plan to impress someone by casually handing them a copy of Anansi Boys, knowing it has a ship in named after them, which is more than they do (hmm. Probably a bad idea that, actually. In a worst case scenario you'd get a restraining order taken out against you and I'd be sued for invasion of privacy or something. Okay, new rule, the person it's named after has to approve of their name being used) -- or if you've just always wanted to be allowed to name a ship in someone else's book, then now is your chance. And you'll be supporting the First Amendment. I spoke to Michael Zulli just now, who pointed me to Michael Zulli : Official Site where he's now doing THE LAST MORPHEUS painting. He got very tired of people asking him for Sandman portraits, and, having already said he wasn't doing any more, has now decided to do one last one: as he says, "it's going to be the biggest, grandest, most detailed, perfect image of the Sandman I'm capable of". Four feet high, two feet wide, and an oil painting. Michael was the artist of The Wake, and is a unique talent. At http://www.michaelzulli.com/progress.htm he's detailing each day's work, beginning with rough sketches, and detailing each step. As I write this he's pencilled it onto the canvas and judging by the noises he was making in the background as I spoke to him, he has just begun to paint. I love the idea of someone using the internet to document the creation of art. Home again, which is good. Lots of fun things waiting here in the mail for me, including Tori's new Beekeper CD and an advance DVD of the Animal Planet Dragons documentary, both of which I'm very much looking forward to. William Gibson, noted author, was once a 19 year old draft-avoiding hippie in Yorkville, and he's seen being interviewed in this 1967 CBC documentary. http://archives.cbc.ca/IDC-1-69-1587-10799/life_society/60s/clip11 I was delighted to discover that even a stoned 19 year old Bill Gibson still deployed words like, well, Bill Gibson. The current news is -- good news, MirrorMask will be getting a wider release than was originally envisioned; bad news, it's now going to be getting to the cinemas later in 2005 than was originally planned. I think it'll be released in early autumn. More news as I get it. No, but I don't mind the lightning on novels that have a connection to American Gods and although Anansi Boys is funny and odd and very different in tone to American Gods, it does share one character with that book, even if he dies on page one. (You can watch me in reading some of the first two chapters of Anansi Boys at the 2004 National Book Festival at http://www.loc.gov/bookfest/04/cybercasts/ram/fantasy/gaiman.ram. You'll need RealPlayer, though.) I think Morrow like the idea of using the lightning bolt to somehow denote that the book is part of the American Gods family. The part of the cover that I wanted, of course, was the web. How do you know when your book is done? Hmm. I forget who it was that said that art is never finished, only abandoned, and that's true up to a point. I'm never satisfied, but normally there's a point that feels like you've reached the end of a story, that the journey begun is now over, and another point, somewhat later, where you feel like something's been fixed and changed and polished as much as it's going to be fixed and changed and polished -- not that nothing more can be done with it but that any more changes are going to make little difference to the end result and might just make it worse. "It's good enough for jazz," I think. And besides, by that point I'm normally getting much more interested in the next project, which is another indication that the last one is probably done. 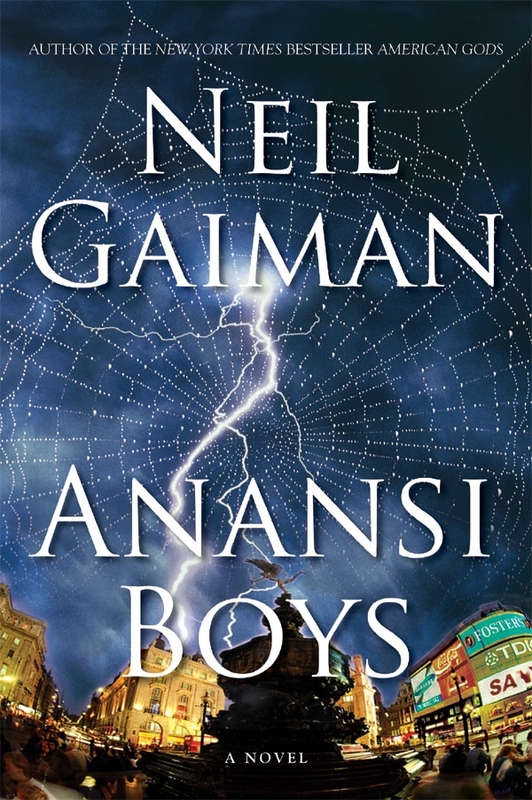 Dear Neil, Love your books, but am horrified by the web on the cover of Anansi boys. You have expressed a distaste for spiders yourself, and even the intrepid Coraline had a thing about them. Of course, in American Gods, the guy turns into a spider- but why? Why do you subject your arachnophobe readers to spiders and to pictures of spider webs?I'll buy Anansi Boys as soon as it is released in New Zealand, but I'll be reading with my eyes closed.Cheers, Sarahjane PS. Please assure me that Anansi Boys won't be illustrated. Why? Er, because Anansi (Mr Nancy in American Gods) is a spider, and because all stories belong to him. Because stories are like webs, or, at least, this one is. And because I'm perfectly happy with the idea that, while large spiders make me (and Coraline) uncomfortable, that's probably a failing in me rather than of the spiders which are inherently cool and charming creatures as long as they aren't both large and sitting on my pillow at the time. You'll probably cope all right with the book, but you might want to close your eyes in Fat Charlie's dream on the plane to Florida, when Grahame Coats brings on the wedding cake. There aren't any plans to illustrate it. And there almost definitely won't be a special New Zealand edition with extra spiders. The CBLDF auction to name the Cruise Ship in Anansi Boys (or to have it named after you) starts on Friday and will run for a week. I'll post a link as soon as I get one. And to correct something I said last week, it seems the e-book of Smoke and Mirrors only contains 3 out of the 5 stories that are in the UK edition. "Fame is rot; daughters are the thing." My daughter Holly was meant to be in Italy right now, but strange European weather and plane problems mean that she wound up trudging back from the airport yesterday, and I changed hotel rooms for one with two beds and she's currently sleeping sweetly in the bed next door, and will be hanging out for a few days until she's ready to try and go to Italy again. I've learned lots about the release plans for Anansi Boys. It'll be published in the US on Sept 20th, and I'll be doing a signing tour of the US, which will probably go until about October the 6th. At which point I'll fly to the UK and go everywhere and sign more books. Today is the photo shoot for the next novel (and given how long the American Gods photo lasted, probably the photo that will be used for the next four years). When I was a boy it seemed like all author photos were black and white snapshots of people sitting at desks. The men smoked pipes and the women smiled. Today will be several hours with Kim Butler -- of http://www.kimberlybutler.com/home.html fame -- who took the beardy author shot from the ALA poster, and I'm pretty certain that I won't suddenly start smoking a pipe. I'll report back on how it goes. Are the five stories in the English edition of Smoke and Mirrors that weren't in the American edition going to be in the new paperback? Um. I'm not sure. Haven't thought about it. Let's see. The background on this is that Smoke and Mirrors came out in the US first. When, a year or so later, it was going to be published in the UK, there was some talk of doing a sample or a chapbook or something to accompany it, so I sent the UK publisher four stories that had been written after Smoke and Mirrors (the fifth story, "Eaten", was deemed too extreme to be published by my editor at Avon, but caused nobody at Headline to turn a hair). Instead of doing a chapbook or something, they simply put them into the UK Smoke and Mirrors, and we wound up with a variant edition. 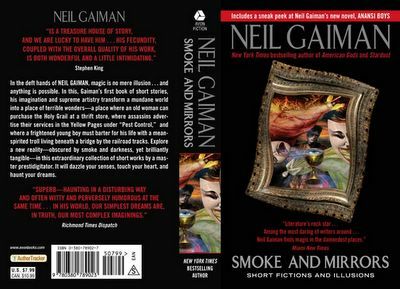 The two options right now would be to put the extra stories into the 2006 US short story collection, or put them into the US mass market edition of Smoke and Mirrors. My hesitation on the latter course is that it might be viewed as a way to make people who already have Smoke and Mirrors go out and buy it again; so it might be easier simply to wait and put them in the 2006 short story collection, while I leave them out of the UK edition of that book. (So spread over the two books, everyone in the UK and the US would have the same stories.) Not sure. I'll chat to my editor. While there's a there is a certain ick-factor to it, growing your own "ivory" jewelry is kinda cool. It's eco-friendly and has loads of potential (scrimshaw, relics, collectibles: the possibilities wondrous, even before taking into account all the situations in which little bits of unexplained bone could cause consternation, should one so desire) and the ick is mitigated by it not being bone taken from a dead person. http://maps.google.com/, which seemed a little klunky when they launched it, is now either getting smarter or I'm just using it more. Lots of plans to overhaul www.Neilgaiman.com, to make things easier to find, to make it cleaner, less cluttered, to make it possible to (for example) read the whole blog archive comfortably (currently a bewildering series of difficult to navigate weeks), or stumble across the short stories (like this or this) or the bibliographies or essays or whatever more easily. I've suggested to Julia the webmistress that we do a survey of some kind to figure out what kinds of things people would actually like to see on the site, and she thought that was a good idea. So expect that sooner or later. In case you missed it, Tim Burton's having a garage sale. Which somehow reminds me of one last thing -- I've got to name a currently unnamed cruise ship in Anansi Boys. I have no idea what to call it, and, a couple of days ago, realised that my utter lack of inspiration could do good things for the CBLDF: later in the week, the CBLDF will do an eBay auction where, if you wish, you can bid to have the ship named after you, your loved one, your dog, or even your favourite word. It's not a particularly exceptional cruise ship, nothing much happens on it, and it will only get mentioned by name a handful of times in the book. I'll announce it and link to it here when Charles Brownstein gets the auction up. I'll put the US cover of Anansi Boys up as soon as I can. 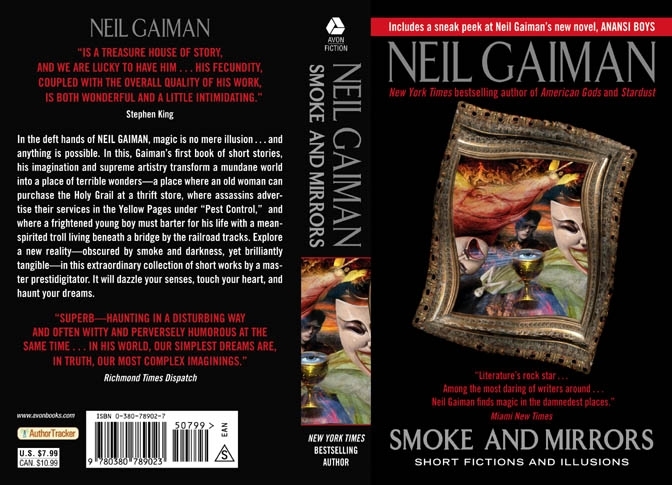 In the meantime, here's the Greg Spalenka mass market paperback edition of Smoke and Mirrors, which should be coming out from Avon Books in the US this autumn. On the cover (click on it for a bigger version), in addition to a holy grail, a sleeping snow white, an angel and the masks of comedy and tragedy, there is also an author, which means that we don't have to put in an author photo. I just listened to your radio play online by very cleverly following your link to BBC and downloading Realplayer and then going to timeanddate.com to calculate the time difference. It was great. Just thought I'd say so, along with lots of others, I'm sure. I felt very part of it, listening and imagining. My dad always listened to "The Shadow" while falling asleep when I was a kid, and I'd listen too, drifting off to 'who knows what evil lurks in the hearts of men...the Shadow knows.' And I sat there today feeling like a wise kid, which is rather difficult to pull off as an adult. Thank you for it, and Dave McKean too for the lovely piano music. At the risk of being a real pest, I wrote a longer "I think this" about the play at http://www.jasminembla.webeve.com/. I assure you at least four more people will go listen to the play once they've read it (yeah, spouse, sis and parents). I really liked what you wrote about it (or at least, it was what I was hoping people listening to it would experience) and I'll pass on your appreciation for the music to Dave. For the next month people can listen to Mr Punch at http://www.bbc.co.uk/radio/aod/radio3_aod.shtml?radio3/thewire. (It's about an hour long -- and I don't think you need RealPlayer for it.) I have no idea whether we'll be able to ever get it out on CD or any more permanent form, so if you're curious, you'll probably want to check it out while it's available. It looks like the Hobbit-sized people were indeed a new species of human, and not just a dwarfish version of the regular kind: http://www.guardian.co.uk/life/science/story/0,12996,1430393,00.html. I know I'm a bit remiss in posting right now. I will do as soon as I get a bit more time. Today I found myself on a panel about things that happened "in the margins", with art spiegelman. Art and I were on the panel to talk to the association of publishers about graphic novels. Neither art nor I had planned a talk, both of us figuring that we knew what sort of thing we ought to say well enough to wing it. But as the panel went on, I jotted down a few topics to discuss while art drew small people on his notepad. Different people on the panel spoke about different things. Then art took the microphone, and proceeded to give, point by point, the speech I'd outlined for myself, sometimes even line for line (my handwriting is small and scritchy enough that I can assure you he wasn't cribbing). I couldn't be horrified, it was too funny. So when it was my turn to speak, now speech-less, I burbled about other things and tried to add grace notes and anecdotes to art's talk, and people seemed to enjoy it. Personally, I think it demonstrated that if you have a panel discussion, if you've got art, you probably don't need me. Lots of people writing to draw my attention to this story, in which William Poole, accused here of trying to "recruit a gang to take over the school," Detective Berl Perdue said. "He didn't have a gang, but he was attempting to organize one," Perdue said. Police said writings in which Poole tried to persuade other students to take part in the takeover were found. This article explains that the writings in question were a short story written for English class about a zombie attack. I'd be more inclined to doubt Mr Poole if there hadn't been a number of similar cases of the authorities being unable to tell the difference between fact and fiction (one of which I wound up joining Harlan Ellison, Michael Chabon, Peter Straub and others in an amicus brief, for a California teen who was expelled after showing classmates his poetry), including, famously, the Mike Diana case.